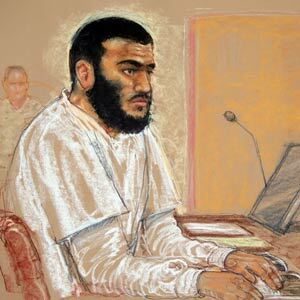 On Oct. 25, 2010, Omar Khadr pleaded guilty to throwing the grenade that killed an American soldier eight years ago. His goal was actually to “Kill many Americans” with his act of terrorism. He has spent his incarceration becoming more and more fanatical about his religion and his anti-American beliefs. He has also become an icon to Canadians of the injustice of the Guantanamo Bay detention camp. Americans refused to extradite him back to Canada, after repeated requests by the government. We wanted to get him out of the prison camp and back on Canadian soil. Khadr doesn’t deserve that kind of treatment. Canada will be getting Khadr back on our soil after he has served one more year that Guantanamo Bay detention camp. In my humble opinion, Khadr should be held at Guantanamo Bay until he has finished his sentence, as he is a war criminal as well as a terrorist, and through his actions as a jihadist, I feel that he has forfeited his right to Canadian incarceration, and should have to serve his sentence where he was tried. the second Khadr threw that grenade, he gave up his right to any Canadian civility. He is a murderer, a jihadist, and a terrorist, three things that this country, as well as the United States, are very against. He made a decision, and even though he was a child soldier, and does deserve some concessions due to potential brainwashing and the impressionable nature of a child, he should be punished to the full extent of the law of the land that he attacked. He also doesn’t deserve the pity of a country that he hates by proxy, assuming that he is part of a jihad against the West. When he reaches Canada, there is a good chance he will be released due to time served. Omar Khadr should be rehabilitated, and if he gets to Canada, my fear is that he will be released for time served. Once released, if not rehabilitated, the process can and potentially will repeat. That is not what we need here, or anywhere. This entry was posted in news and tagged GITMO, Guantanamo Bay, jihad, military, news, Omar Khadr, Opinion, rights, terrorism. Bookmark the permalink.